This salad presents a new way to enjoy grapes. Roasting the grapes with balsamic vinegar creates a sweet and savoury vinaigrette to spoon over a simple salad. Meanwhile, divide greens and kiwifruit between four serving plates. Sprinkle evenly with goat cheese and walnuts. Spoon the warm grape mixture, along with juices, over the salads. 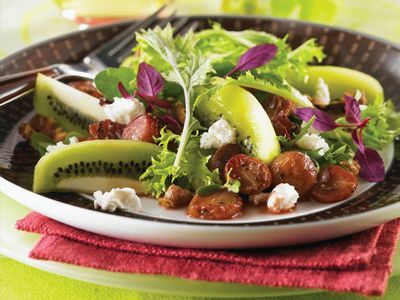 Add sliced grilled chicken, pork or salmon to serve as a main-course salad. Or spoon the warm grape mixture over Brie or Camembert cheese and serve with crackers as an appetizer or as part of a cheese coarse.